Will Daniel Alfredsson Join the Hockey Hall of Fame? 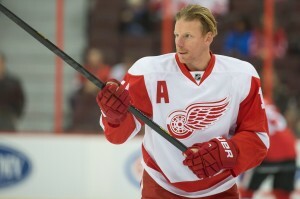 Is Daniel Alfredsson Likely to be Voted Into the Hockey Hall of Fame? Sean McIndoe of Down Goes Brown recently spent some time looking at if Daniel Alfredsson should be, or if he will likely be, voted into the Hockey Hall of Fame (HOF). The long and short of it is that Daniel Alfredsson has spent a long career with the Ottawa Senators until last year where he moved to the Detroit Red Wings. His career was consistently good but rarely the best in the league. There has been plenty of research in baseball using Machine Learning techniques to try and predict which players are likely to be voted into their Baseball Hall of Fame. This research. This research uses algorithms such as Neural Networks and Decision Trees and focuses on attributes such as single season offensive and defensive numbers in addition to career and season end awards. These algorithms can predict with 75% accuracy or higher. Rob Vollman wrote about a similar tool for hockey called the “Inductor”, which was originally described and developed by by Iain Fyffe, in the 2014 Hockey Abstract. Using a number of proprietary techniques, likely based on regression, Fyffe has identified a number of different variables which are key in determining if a player has a high probability of being voted into the Hockey Hall of Fame. We can use this to look at the different factors that affect Daniel Alfredsson and guess if he is likely to be voted into the HOF (not, if he should be). This is a bit odd, because the selection committee is made up of hockey “insiders”, who are the type of expert who will emphasize that scoring totals are nice, but “they don’t win hockey games dontcha know”. They’re the type that says “defence wins championships” and derides “soft” players who don’t back-check. And yet, when it comes to selecting players for the Hall of Fame, it seems that these knowledgeable insiders are as easily swayed by scoring totals as casual fans are; it must be very hard to ignore a career record with “1,000 points” at the bottom. From a pure objective view it seems reasonable that Alfredsson should be inducted into the Hall of Fame. When we look a bit deeper, based on the factors that matter most, the outcome does not look so great for Alfie. From the Hockey-Reference Player Season Finder, between 1995-1996 and 2013-2014, Alfredsson is 5th in points, 4th in assists, 5th in goals and 8th in games played. Unfortunately those who vote players into the Hockey Hall of Fame tend to make their decisions on a much wider array of choices. When we look at the players with careers most similar to Alfredsson, while some have been inducted into the HOF such as Brendan Shanahan, many others have been eligible for a while and have not yet been inducted. The longer a player waits to be inducted, the less likely he will ever see his name included. We can use the Inductor to look at those features which are most predictive to a player being selected for the HOF. The first of these is the number of All-Star Teams selections a player has; you need to be considered one of the best players in the league, at some point in your career, to be considered worthy for entrance to the HOF. Alfredsson has one All-Star team selection which was in 2005-2006 for the Second All-Star Team. Players with only 1 All-Star selection have an 18% chance of being inducted into the HOF. Additionally Alfredsson was once voted to the NHL Rookie All-Star team. The second most valuable indicator are individual awards which indicate high scoring players and not brutes. The most predictive awards are the Hart, Pearson and Lady Byng. 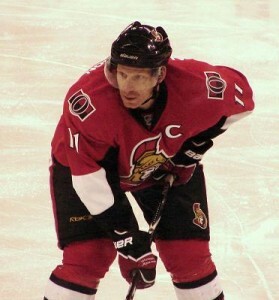 The Calder Trophy is the only individual award that Alfredsson has won. He was also nominated for the Selke and Lady Byng twice. The lack of awards does not work in his favour. Career goals are very important for HOF inductees with 300 career goals seemingly being the minimum number required to be voted in, with 500 goals being the sweet spot to be nominated. Alfredsson’s 444 career goals works in his favour but it is not quite enough to bring up his inductor score. A few other indicators which help a player by the Inductor’s analysis is: having a long career, which Alfredsson without a doubt has at over 1,200 games; winning multiple Stanley Cups, which Alfredsson has none of; and having 50-goal and 100-point seasons of which Alfredsson only has one for scoring 103 points in 2005-2006. Despite his success at the international level including an Olympic Gold and Bronze medal as well as winning the Swedish Championship, these seem to mean little with the voters. All in all there are good arguments that Alfredsson should be in the Hockey HOF with his long career of individual success. But the HOF voters seemingly vote along different lines. Looking at if Alfredsson is likely to be voted into the HOF the outcome doesn’t look so positive. If I were a betting man I would guess that Alfredsson is not a likely candidate to be inducted into the Hockey Hall of Fame because of his lack of All-Star Voting. This doesn’t mean that Alfie shouldn’t be in the Hall of Fame, it’s mere analysis of the probability based on the past behaviours of the voters.